Binance Is Now More Profitable Than Deutsche Bank - Germany's Biggest Bank! 2018 is proving to be an interesting year for fin-tech companies. Q1 of 2018 saw Deutsche Bank, one of the leading financial institutions in the world and Germany's largest bank, posting a profit of $146 million. However, it was aced by the world’s largest cryptocurrency exchange Binance which recorded a profit of $200 million! The Binance cryptocurrency exchange has been in existence 8 months ago and has created a record of sorts in beating the 148 years old Bank in terms of profitability. Binance currently has 200 employees whereas Deutsche Bank is a giant with 100,000 employees. For a country like Malta, the relocation of Binance creates more opportunities than a bank right now. It is going to bring in big revenues to the tune of few million dollars along with employment opportunities. Given the increasing interest in cryptocurrency exchanges, and particularly the growth of Binance has also been shown interest by venture capital firms to be invested in. The growth of startups in a small European country would be a harbinger of growth and employment for the educated population. Germany has recently been working on its tax laws. The country is considered to be one of the most crypto-friendly nations when it comes to taxation as Germany does not tax the use of cryptocurrencies when they are used as a payment token. Moreover, Germany's tax laws are also Bitcoin Mining friendly - giving miners a motivation to mine. Financial comparison of this level certainly makes one sit up and notice of the cryptocurrency interest and the money flowing in these exchanges. The market capitalization of the cryptocurrency market stands around$ 400 billion which are still less than the combined market cap of HSBC and JP Morgan. Yet one can see that it has achieved a lot in a considerable a short time from 2009 to 2015 till Ethereum came into the picture with its tokenized ecosystem. The fact remains that a 200 employee organization, not even a year old in its inception beating the likes of the old and gigantic banks like Deutsche demonstrates the healthy and promising development of the cryptocurrency market. 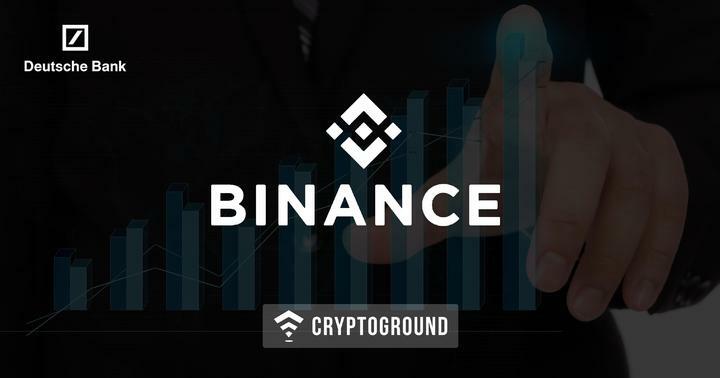 Binance, interestingly, has proven to be one of the biggest and the fastest growing cryptocurrency exchanges in the world. The company is the fastest to reach a 'unicorn status' - amassing $2 Billion in funding in less than a year's time! As long as the demand for the cryptocurrency trading is sustainable and institutional investors continue to enter and exit it is possible that cryptocurrency businesses can take over the global financial industry in the next few years. This would be in line with predictions by supporters like Tim Draper and Peter Thiel who see the Bitcoin as a triillion dollar industry in a few years’ time.